Operation ID—developed by the police, but little known by the public—has very humble beginnings, dating back to a time before mainframe computers and modern enterprise asset management systems. It goes back to a time when records were kept on index cards in tiny drawers, on sheets of paper in filing cabinets and in ledgers stored on book shelves (messynessychic.com/2016/03/24/inside-the-fbis-colossal-fingerprint-factory). In response to the escalating numbers of burglaries and thefts of portable electronics, the Operation ID strategy was developed by law enforcement professionals in 1963 and rolled out nationally in 1979. If citizens would just get into the habit of using Operation ID, the police would have a potent tool for solving property crimes. The National Sheriffs Association still actively promotes the original strategy (nnwi.org/operation_id.php). The widespread use of security cameras and alarms has reduced burglaries and thefts only slightly. When burglaries and thefts do occur, only 10% are ever solved because citizens haven’t taken the critical step of recording serial numbers (ucr.fbi.gov/crime-in-the-u.s/2010/crime-in-the-u.s.-2010/clearances). In the early 1960s, the consumer electronics movement was in its infancy. Many items were still using vacuum tubes. Transistor radios were becoming popular and FM radio was just beginning to spread. In this period of mass production, identical items were assigned unique serial numbers for quality control purposes. If there was a problem with one item, it was likely the entire batch could be defective. Millions upon millions of unique consumer electronic items were flying off production lines and the only thing separating one from the other was a unique serial number. According to Wikipedia, “Serial numbers are a deterrent against theft and counterfeit products, as they can be recorded; and stolen or otherwise irregular goods can be identified. Banknotes and other transferable documents of value bear serial numbers to assist in preventing counterfeiting and tracing stolen ones” (en.wikipedia.org/wiki/Serial_number). This is at the heart of why large institutions go to so much trouble to mark and register property, and it is at the heart of the tragedy that so few individuals, homeowners and small business owners don’t. Again, 90% of property crimes are never solved. 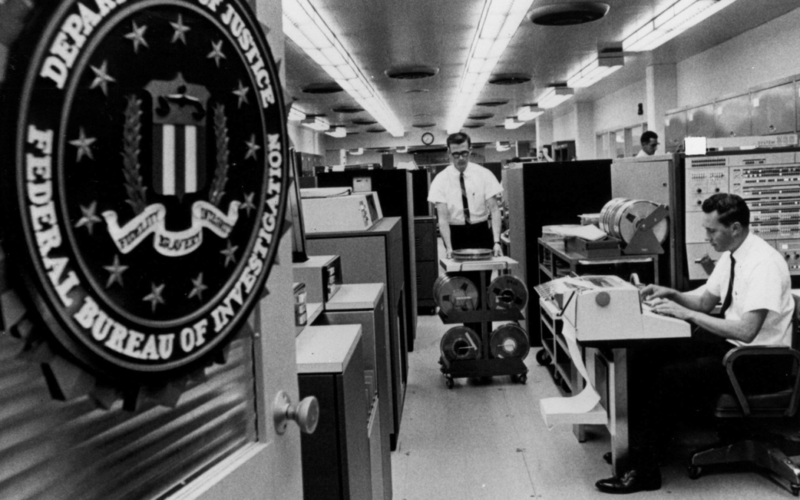 Beginning in 1967, with the advent of the mainframe computer, stolen property could be traced by law enforcement professionals entering the serial numbers of stolen items into the FBI’s National Crime Information Center (NCIC) clearinghouse. Today, this happens on laptops mounted right inside squad cars (fbi.gov/services/cjis/ncic). Pawn shops check the massive NCIC for stolen property, and police recover huge caches of stolen property when they execute search warrants. Every serial number of recovered property is checked against the NCIC. When items are not listed in the NCIC, pawn shops resell stolen items and police warehouses fill up with untraceable items and eventually destroy it all. The early 1960s saw the development of mass produced etching/engraving tools. These are high-speed devices that have high-strength steel tips or industrial diamond tips. Etching tools are used by consumers to easily mark items too hard to mark by hand. Law enforcement professionals immediately saw a use for etching tools. They encouraged citizens to mark portable electronics with an identifier so lost and stolen property could be easily returned, and to record the serial numbers on a sheet of paper to be kept in a citizen’s home files. There are risks to engraving a mailing address or phone number on valuables. If the stolen items fall into the hands of violent criminals or other predators there is risk of abuse or worse. Back in the 1960s, many states used Social Security numbers as driver’s license numbers. This was considered secure information as the internet had not been developed yet. So the police recommended citizens etch their Social Security numbers into their personal belongings which only the police could access. In later years, the universal identifier became a driver’s license number combined with the two-letter state abbreviation. Today, we look at these solutions as highly insecure. Operation ID was developed for individuals, families and small businesses in 1963, rolled out nationally in 1979 after 378 studies at a cost of $100 million in 2018 money, and endorsed by the Int’l Assn. of Chiefs of Police, the National Sheriffs Assn. and the FBI. It was a complete and utter flop (mypropertyidregistry.com/2018/08/04/operation-id-marketing-flop). At the same time, with the development of the mainframe computer, a billion dollar industry segment was born called enterprise asset management (EAM). Now every large military contractor, corporation, university, government and hospital has it’s own universal identifier tied to its company name. The public knows little of how this strategy works, but they get tiny hints when they see asset tags on the backs of computers and printers with a number and the institution’s name, logo and colors. For large institutions with EAM systems in place, there are policies and procedures for what to do in the event of a crime, particularly for military contractors (acq.osd.mil/dpap/dars/dfars/html/current/252245.htm). Because law enforcement professionals typically want the make, model and serial numbers of stolen items, it’s a snap for asset managers to access and deliver the pertinent information very quickly. Just like in the 1960s, the same problem remains today. When it comes to residential and small business burglaries and thefts, of crimes, 90% go unsolved. It doesn’t matter if a home or business has security cameras and an alarm system, the police only want serial numbers. The problem is that the vast majority of citizens don’t have these records and don’t fully grasp why the police need them. The mEAM strategy is designed to make capturing the information the police need at the consumer level easy and online. Very small businesses wanting to break into government contracting can do so with a miniaturized enterprise asset management (mEAM) system. This is a valuable opportunity for veteran-owned, women-owned and minority-owned small businesses looking for an edge in the government contracting arena. Also, large contractors often use subcontractors that could benefit from a smaller asset management strategy. Sometimes large enterprises don’t want to use their own asset tags to identify portable electronic items used in public, such as laptops, because it is a security risk. With a third-party mEAM system, the odds of recovery increase while not revealing the name of the rightful owner. Finally, just like the Operation ID strategy originally developed in 1963, mEAM systems still work as promised by providing a low-cost and reliable burglary deterrent and lost and found for individuals, homeowners and small businesses.